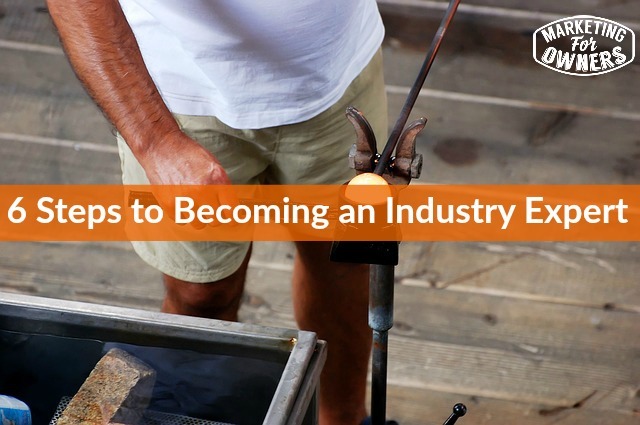 Today I want you to think about becoming an industry expert. Now of course, I am doing this in six steps. There are more steps out there, but today I am just talking about six. This is not going to magically get you onto TV and get you a slot on breakfast TV and your own show on the Oprah Winfrey channel or anything like that. But it’s a start. In our little world, we can become an industry expert. And what happens when you become an industry expert, people look up to you, customers want to use you because you are the best; you can charge higher prices etc. 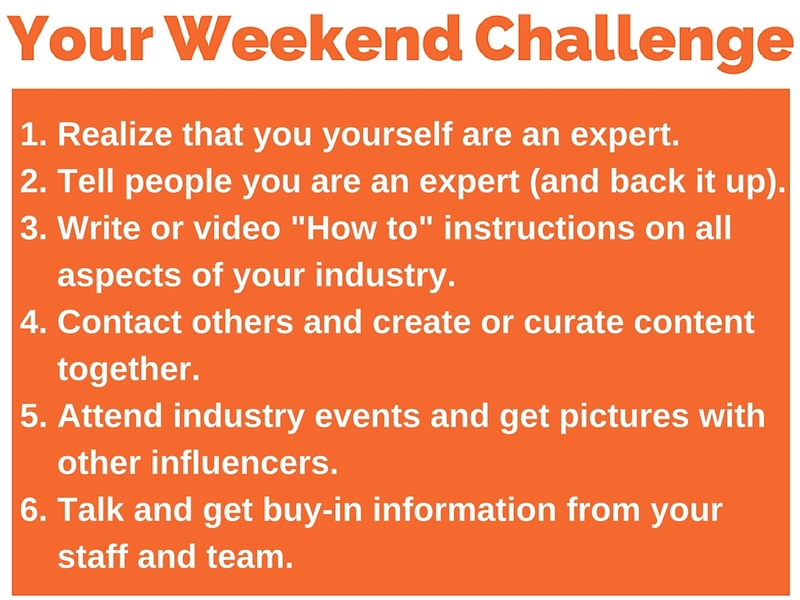 It’s Friday, it’s time for a weekend challenge. I understand you might not want to do that because next Friday is Christmas, and you’ve got shopping to do. But, if you are like the rest of us, then you’re going to fit in a bit of work, and you’re going to check some e-mails, so why not use it productively and challenge yourself? Do something different. Grab your pen, paper, pad, and pencil. I don’t mind but I’d prefer you to write them. If you cannot write them down, no worries! You will find them all below. #1 Realize that you yourself are an expert: Yes, unless you can convince yourself, you might as well not bother listen to the others. In fact, if you’re not going to convince yourself, I don’t mind if you just turn this off and just go back to your life and go on doing some other stuff because we’ll all be your industry’s expert for you. Now I know you’re not going to do that. Let me give you an example. For marketing, I work in marketing, I teach marketing, I show marketing, I demonstrate marketing; but the reason I do is because I have done it, I do it, I do this every day for real, for my company. The reason I feel I am able to show you how to do or tell you how to do with these things, is because I have done it, I have done it over and over and I know it works, it’s quite easy for me. So, I feel that I am in a position to do it. Are there people that know more than me? Oh yeah! But it doesn’t matter, I am still an expert, I know, ask me a question, try me, e-mail me, jon@marketingforowners.com, and ask me a question about something in your marketing. Ask me if I can help and you will quickly get a reply and you will find out if I know what I am talking about. So, convince yourself. If I didn’t think I was, would I be doing podcasts teaching you? Because I would think I would have thousands of people listening. #2 Tell people you are an expert (and back it up): In other words, tell people you’re an expert. So I have just in effect told you I am a marketing expert. I am a marketing expert for small businesses and business owners, but in medium sized businesses, I bet you I could give them some hints, but it’s not my niche. I confidently could tell you, give me one hour, give me half an hour with you and your business and I could give you some tips, instant things that will increase your profits instantly, for free, I guarantee it, I am an expert. What reason have you got to doubt me? This is the thing, if you don’t tell people you’re an expert, they’ll form their own opinion. But you run a restaurant, you have customers; is your restaurant empty? Why do they come? Because you are an expert at running a restaurant of your style and of your cuisine in the way you run it, you are an expert. No, you may not be Gordon Ramsay, who wants to be Gordon Ramsay? It’s not the same. There are plenty of niches, people need you, they need your advice, you’re good, they come back, they think you’re great. 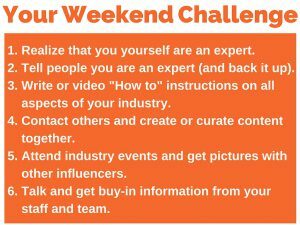 #3 Write or video “How to” instructions on all aspects of your industry: So, now we start to back up your expertise. You know stuff because you read the trade magazines, you talk to other people, you have been doing it for 5, 10, 15 years; maybe not for yourself, maybe in a previous job, you know the in and outs. If you don’t, perhaps this isn’t the job for you, perhaps there is a better business more suited to your talents. But I am going to imagine that you’re doing this because you like it and because you know everything you need to know, so start to record videos. How about this? Do you think, I am an expert on teaching people how to become an expert, I am just making this up. How long did it take me to come up with the content? It took me 5 minutes when I was putting my coat on, really. And I did type it on an iPad just so I can remember. Because as I have just come up with these from my experience, it would look silly if I forgot them as I was reading them out. So make “How to” instructions, just put them on YouTube and then embed them on your blog. Don’t you tell me you haven’t got a blog, go back to lesson one. You know what I mean, but anyway, put them on YouTube, even if you haven’t got a blog yet, you better put one up tomorrow. If you haven’t by the way, go to www.website101.co, you will have one within 60 days, or you get your money back. That’s my product. So that’s that. But you can put them on YouTube for now, don’t you worry, just start recording them, they can be 30 seconds, they can be 1 minute, don’t make them too long; 2, 5 minutes. I know these are 10 but this is a podcast, this is mine, don’t complain. #4 Contact others and create or curate content together: Now when I say contact others, I mean contact other people in your industry, not the person you think is your arch rival, although they are not really your rival, they are a colleague in your industry, you’re all after the same thing. If you call them and tell them you, would be surprised how friendly they would be. I get interviewed on podcasts, I interview people on my podcast for the new show that’s coming up in January by the way, I’ll tell you about that later, and these people are in marketing and the ones who ask me are in marketing. They don’t think I am a rival, they want to further give more information to their industry and by you being the one that asks them, you take the upper hand, because you display them to your audience and it makes you look slightly above them. But it works both ways, they will tell their audience because you are an expert, they will say “Hey, I was featured on so and so’s video, I wrote an article for…. “etc. Who on earth in front of everyone is going to say “No”. I mean, at your industry events, you have trade associations, you must be a member. Trade associations, you have conferences, things like that; if you’re not attending these, why not? Why aren’t you learning? So you’re not going there just to hob-nob with these people, you’re going to learn and you will learn from people, they will also learn from you, don’t undersell yourself. There are things that you know that they will think, “Oh, interesting.” Everyone started somewhere, they are the same. But get pictures, feature them on your blog, you know, you with your arm around, and put their names, don’t think everyone is going to know who they are. But it just permeates through, you get fame via osmosis. You can then tweet, when you put it on Twitter, you include their handle and it goes on their thing and it’s got a picture of them with you; you will get put in front of their audience. So, clever stuff. #6 Talk and get buy-in information from your staff and team: So talk to and get the buy-in from your staff and team. Explain why you are doing this to your staff, explain what this is going to do, oh this is going to further the business, how it’s going to further their position, them. They don’t want to hear that, oh you’re going to make a fortune, you’re going to buy yourself a helicopter, a Ferrari and a boat next week. They want to know what’s in it for them. But once you get buy- in, once they go, “Oh yeah, that makes sense”, once you get that, it’s all downhill from there because they will be able to help and they can help you build your brand once they know why it’s happening. Anyway, that’s it. I’ll be doing a bit of last-minute Christmas shopping over the weekend. What are you doing after this challenge? Whatever it is, have fun, enjoy it with family and snuggle up if you live in a cold place where it’s raining. Snuggle up in front of a warm radiator or a nice hearty fire. Which tip will you work on next?